ontinuing following the disapearance of Private Ben Garrett in the city last week. 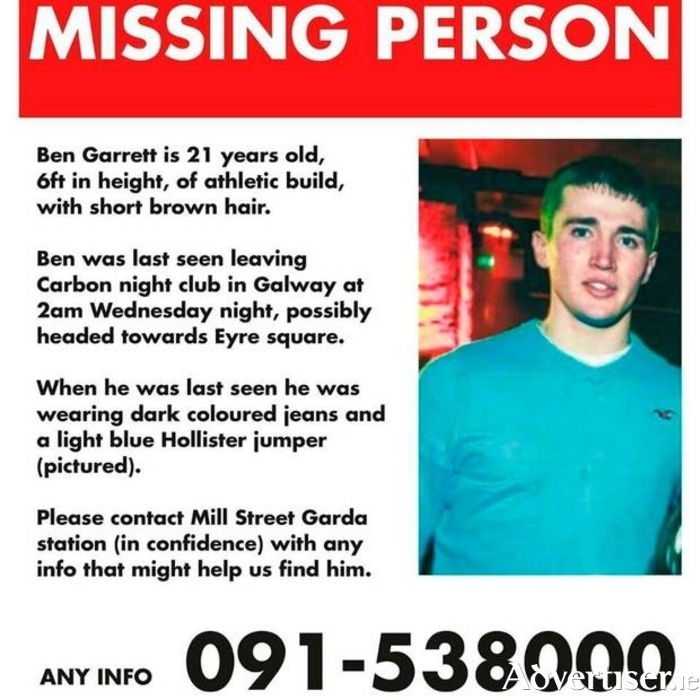 Private Garrett, who is originally from Castlebar, has now been missing for eight days. He was last seen leaving Carbon nightclub on Eglinton Street in in the early hours of last Thursday morning. The Army member, who is based at Renmore Barracks, is described as being 6ft in height, of athletic build with short brown hair. There has been a sustained campaign on social media to share the image of the missing man, but unfortunately the awareness about the case has not, as yet, helped to yield a result. Hundreds of volunteers have been attending a daily search that is being co-ordinated from Liam Mellows GAA Club every morning. The Gardai are leading the search with assistance from the Defence Forces, and the Oranmore Maree Coastal Search Unit.